Recently, I gave a conference on website strategy. In the process of defining the strategy, one must find how the website can contribute to the entire organizational strategy. For this, I have tools and one of them is the “Website Financial Value Map”. I use it in brainstorming sessions to identify areas where the website can create value by either growing the revenue or reducing the costs for the entire organization. I published a first draft of this tool in October 2010 in a post called “Website Value Map”. The inspiration for the map was a diagram called the “Deloitte Enterprise Value Map TM” by the giant consulting company. The Deloitte map shows how to create value for shareholders in 800 boxes. I must admit not being completely satisfied by my “Website Value Map”. This post is, I hope, an improved version of the concept. If you have ideas on how to improve it, please leave me a comment. In the process leading to the development of a new website, there comes a point where we need to decide how much money we are willing to invest in this digital asset. I have seen many strange ways of doing this and some of them involve Voodoo. Personally, I prefer a different method. It is a little less magical but it will likely appeal more to the finance guys who approve budgets. It involves preparing estimates for the costs savings and revenue growth stemming from the website presence. The precision of the estimates can be argued but the financial analysis will be just as valid as when analysing investments in additional stores or production equipment. Here is the financial value map. It is a bit small to read but you can click on it to get a larger scale version. Further down this post, each lower-level box is explained. Revenue growth is for the entire organization. It may come from new customers and from existing ones. New territories: With a website, geographical boundaries disappear. The cost of doing business outside the current trade area is relatively low, unlike the physical world where you have to own or rent a presence in the marketplace, staff it and maintain an inventory. For example, L.L.Lozeau, a large photo and video equipment retailer in Montreal, has only one store. With its website, it is able to do business across Canada and must be quite successful since it claims to be the largest such retailer in the country. Current territories: No matter how many points of sale you have, a territory is never perfectly covered. It is also possible that some customers cannot, or do not wish to get to your point of sale. Also, given that people often prepare their shopping online, not being on the web will reduce drastically your chances of being considered as a supplier. The websites visited will have a much better chance. New product & services: In a physical store, it is not profitable to hold in inventory all products and their variations. Usually, only the products that sell the most are available. That constraint is not as severe with websites. The demand for orange baseball shoes size 13 is probably too low to be in most shoe stores. A website can more easily maintain them in inventory and will consequently increase the range of products offered. A website can extend the hours where your services are available (think of online stock brokers). It can also offer services that cannot be offered easily and cheaply in physical stores. A librarian can recommend books after providing a lot of information. Amazon will do the same much more easily. Upsell & Cross-sell: Cross-selling refers to the practice of promoting complementary items related to the item being sold while up-selling is the practice of offering customers an upgraded or premium version of a product. These techniques are as old as commerce. However, on the web, they can be applied systematically and often with better results because the website knows the customer even more, based on previous browsing or purchasing history. 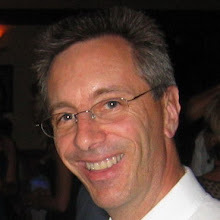 For example, when I designed the www.bissell.com website in 2000, after someone would place a vacuum cleaner in the shopping cart, we would offer them a higher end model at a discount. We would also offer them cleaning accessories that matched the product in the shopping cart. In both instances, the customer would also benefit with either a discount or the assurance that the accessories presented were complementary and compatible with the desired vacuum cleaner. Customer retention: It is a cut-throat world out there and maybe your website can contribute to keep your customers from going to the competition. The Brunet pharmacy recently started offering a service on its website to allow customers to easily view and renew their prescriptions. Not only does this service differentiate this chain of pharmacy from the others but it will probably increase their customer retention. Support costs: In the early years of the web, support cost reduction was the justification to invest in websites. That argument is still valid today, even with outsourced support centres and minimal communication costs. The web can offer self-service support 24 hours of every day without additional expenses. Selling costs - Online: Selling costs include both customer acquisition and sales. In the physical world, customer acquisition can be costly. You need to pay for a physical presence, for the inventory and for the selling staff. Not so much in the digital world. Thanks to Google, a lot of potential customers will find your website without you having to pay much for promotion and advertising. Once on your website, the sale can take place with almost no marginal costs. Rotisserie St-Hubert introduced in 2010 the possibility of ordering your meal using their website. Not only do they save in their call centre but the purchasing process is easier for the customer, increasing the likelihood of repeat business. Selling costs - Offline: ROPO means Research Online Purchase Offline. It describes the trend where people who do their shopping research on the Internet and then finalize their purchase in the physical world. Today, who will go to an electronic store to buy an HD TV without going first to the web for reviews and advice? Who will buy a house without going first to MLA and the websites of various real estate brokers? Very few. Consequently, when a customer meets a salesperson in a store, the sale is finalized more quickly and the productivity of the salesperson increases. 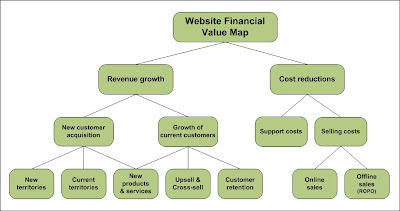 The “Website Financial Value Map” is a tool to identify revenue growth and cost reduction opportunities. It will help determine the maximum investment that can be made in the website while remaining profitable. It will appeal to decision makers who require a stronger financial analysis. It will also help the web strategist in choosing the most profitable content and functionality to include in the website. This tool does not cover all types of value-creation opportunities with a website. I use other tools for that. One focuses on value creation for your customer. If your customers cannot find value for themselves, the financial opportunities will never materialize. My last tool is a list of value creation ideas per department within an organization. Those also need to find a plus-value in the website or else, their support will be limited and synergies will be lost. Web Site Strategy and Organizational Strategy. I already introduced this tool to the entire team and now, we've received nice feed backs for having a good presentation of our client's investment in our company. I should probably consider using that tool so I can keep track of my website's financial value. I really think it can help.